See that? Most hated team. 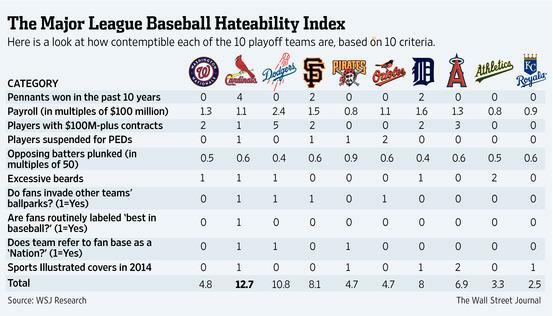 Of course, we're playing the second-most hated team in the division series. This ranking received lots of attention on Twitter, even from the mayor of St. Louis. Hate the Cardinals, Giants and Dodgers. That's why I don't watch the MLB playoffs. I hate the Cardinals because it always seems as if they kill my hopes whenever we actually make it to the postseason. Welp, it's October. Time to hate the Cardinals like it's my job. God I hate the cardinals. Pirates should have won the division. Breathe if you hate the Cardinals. If you hate the Cardinals, you're okay with me! Go Royals! Cardinals fans: "Don't hate us because we're successful." Man I understand a lot of y'all hate the cardinals and the fans but sorry we're a successful franchise! I don't need you people to remind me why you hate the Cardinals. Just keep kissing the rings. I find it highly entertaining reading all of the banter regarding how folks hate the #Cardinals. Top-notch farm-team system = great reason to hate a team. Can't hate them for their hot manager, though.